2008. Hardcover. New. The true story of America's first great explorer and adventurer—an African slave named Esteban Dorantes Crossing the Continent takes us on an epic journey from Africa to Europe and America as Dr. Robert Goodwin chronicles the incredible adventures of the African slave Esteban Dorantes (1500-1539), the first pioneer from the Old World to explore the entirety of the American south and the first African-born man to die in North America about whom anything is known. 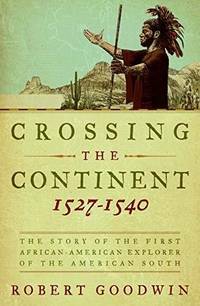 Goodwin's groundbreaking research in Spanish archives has led to a radical new interpretation of American history—one in which an African slave emerges as the nation's first great explorer and adventurer. Nearly three centuries before Lewis and Clark's epic trek to the Pacific coast, Esteban and three Spanish noblemen survived shipwreck, famine, disease, and Native American hostility to make the first crossing of North America in recorded history. Drawing on contemporary accounts and long-lost records, Goodwin recounts the extraordinary story of Esteban's sixteenth-century odyssey, which began in Florida and wound through what is now Alabama, Mississippi, Louisiana, Texas, New Mexico, and Arizona, as far as the Gulf of California. Born in Africa and captured at a young age by slave traders, Esteban was serving his owner, a Spanish captain, when their disastrous sea voyage to the New World nearly claimed his life. Eventually he emerged as the leader of the few survivors of this expedition, guiding them on an extraordinary eight-year march westward to safety. On the group's return to the Spanish imperial capital at Mexico City, the viceroy appointed Esteban as the military commander of a religious expedition sent to establish a permanent Spanish route into Arizona and New Mexico. But during this new adventure, as Esteban pushed deeper and deeper into the unknown north, Spaniards far to the south began to hear strange rumors of his death at Zuni Pueblo in New Mexico. Filled with tales of physical endurance, natural calamities, geographical wonders, strange discoveries, and Esteban's almost mystical dealings with Native Americans, Crossing the Continent challenges the traditional telling of our nation's early history, placing an African and his relationship with the Indians he encountered at the heart of a new historical record.